Worried about that old air conditioner or noisy heater? Overwhelmed with information about buying a new heating and cooling system? 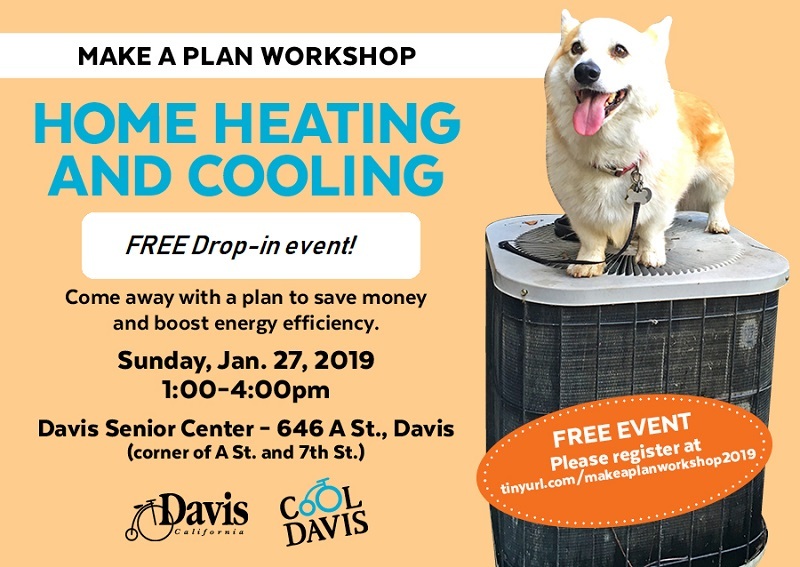 Davis residents are invited to drop-in to a Home Heating and Cooling “Make a Plan” Workshop on Sunday, January 27, 2019, from 1pm to 4pm at the Davis Senior Center 646 “A” Street in Davis. Homeowners looking to avoid the stress of a broken-down heating or cooling system can chat one-on-one with experts at “Ask an Expert” resource tables on topics like system maintenance, home energy assessments, incentives and financing, and energy efficiency options. Participants can come away with the beginnings of a plan to guide decision making and save money. This is a free, drop-in event, but interested community members are encouraged to register to help with planning. Get your ducts in a row! The main goal of the event is to help homeowners understand their options and make progress on a plan for responding to break downs and investigating energy efficiency upgrade opportunities. Particular emphasis will be placed on tips for selecting the right sized system, costs versus benefits, and energy efficiency improvement options. Confused? Organizers hope this workshop will reduce your confusion and help you improve health and comfort in your home. Registrants will be given the option to indicate their preference of two start times for the presentations. Seats for the presentations will be filled on a first-come, first-served basis. Registrants will be encouraged to take a short pre-event survey. Attendees will also have opportunities to share their successes and struggles with home heating and cooling at various stations at the event. Parking is available but participants are encouraged to bike, walk, or skate on over (gliding on electric power works, too); the “A” Street entrance is the shortest route to the event. Follow the signs to check in. This event is co-sponsored by Cool Davis and the City of Davis. Email questions and other inquiries to coolsolutions@cooldavis.org. For more information about home heating and cooling, visit this Cool Davis Cool Solutions web page. Chrissy Backman has a strong foundation in water, waste, and resource management including her work as a mechanical engineer modeling residential building energy use and efficiency strategies. Chrissy is also an urban farmer who has transformed her yard into a food forest filled with various greens, tomatoes, and squash, plus avocado, citrus, and peach trees. Chrissy’s home sports a chicken coop and a laundry-to-landscape greywater system. She has built a deck at every home she’s ever lived in. Chrissy strives to help others live a fulfilling life in order to create a stronger, more resilient local community. Chrissy is a professional engineer and serves on the board for the Valley Climate Action Center. She consults part-time with Davis Energy Group.